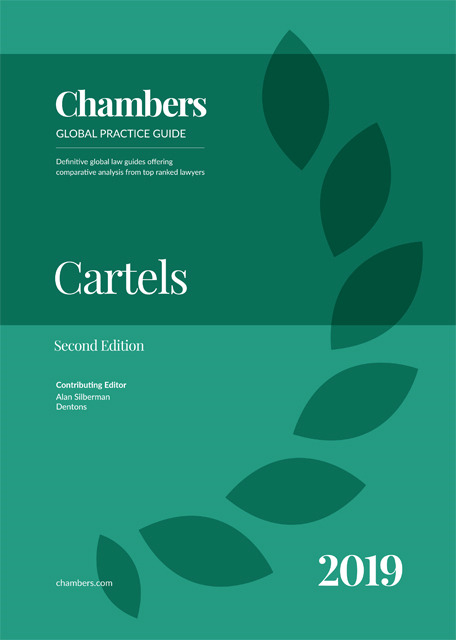 The Cartels guide provides expert legal commentary on the key issues for businesses with competition matters. The guide covers the important developments in the most significant jurisdictions. Dentons represents a broad range of businesses and individuals, including prominent financial services firms, insurance companies, multinational companies, emerging and closely held companies, entrepreneurs and high net-worth individuals. Clients benefit from working with lawyers who understand their business, listen to their specific goals, and customise innovative strategies to help to achieve them. Denton's New York office complements the firm's other global offices, leveraging human capital and know-how with a focus on governmental relations, public finance, tax, trusts and estates, capital markets, structured finance, corporate law, real estate and dispute resolution involving all aspects of business litigation, restructuring and bankruptcy. With experience across industries such as real estate, financial services, oil, fashion, home apparel, retail, luxury goods, technology, media and entertainment, the firm is prepared to hit the ground running. Dentons' global presence and local capabilities help clients fulfil their business objectives anywhere around the world. To many, the term "cartel" calls up images of secret meetings in which sizeable companies with global footprints fix the prices for the products they sell, leading to government action and, in some jurisdictions, multi-million dollar private class actions or actions for collective redress. These are, of course, classic examples of cartel behaviour. However, a more durable definition is one that encompasses a wide variety of arrangements between actual or potential competitors involving agreements that may set or affect PRICE (or price factors), OUTPUT (including volume and geography), PRODUCT (including features, characteristics, and other classifications), PRACTICES (such as operating rules, restrictions on innovation and the like) and often INPUTS (such as raw materials used, sources, employment practices and restrictions, and related costs). A memorable, if not also useful, acronym is P-O-P-P-I. The definition used by the Australian Competition and Consumer Commission (ACCC) is even more direct and simple (if somewhat overstated): "A cartel exists when businesses agree to act together instead of competing with each other." The number and variety of proceedings involving cartel behaviour, applying sanctions to all manner of POPPI agreements between competitors, increases annually. It is the meat on which regulatory authorities, worldwide, feed; and the impact on business entities and individuals caught in these proceedings -- both criminal and civil -- can be extraordinary. Over 130 countries, as well as the EU, have some form of competition laws, and co-operation between regulatory authorities is robust. Put simply, agreements that restrict the decisions of competitive market participants in any of the POPPI categories are likely to be problematic and should only be pursued after obtaining legal guidance from qualified and experienced counsel. The targets of competition agencies are varied. Small- and medium-sized enterprises, and activities in economic sectors that might be thought of as less significant, do not escape scrutiny. Consider the activities in the past year of the US Department of Justice Antitrust Division. They range from opposition to a proposed regulation that would bar Kansas real estate brokers from offering gift cards to home buyers, to action against companies using electronic media to set the prices of customised online promotional products, to foreign exchange manipulations, to employers' "no-poaching" and wage-fixing agreements affecting workers and classic alleged price-fixing and/or market allocation schemes in international shipping, electrolytic capacitors and packaged seafood. In 2017, nine criminal cases went to trial, 30 individuals were sentenced to prison, and criminal fines now regularly exceed USD1 billion each year. In addition, cartels face the administrative authority of the Federal Trade Commission, which has been applied to a trade association code of conduct restricting competition among organists and chorus conductors and fee-setting methods used by appraisal management companies. And state attorneys general maintain antitrust enforcement teams under their state antitrust laws as well. Competition authorities' actions against cartels in major sectors of the economy -- energy, transport, banking and finance, public project bid-rigging etc. -- are well-known. But regulatory scrutiny also extends to matters as diverse as cleaning services; arrangements among four publicists; two cardboard box companies (with one given immunity for co-operation), metal-packaging manufacturers (referred by Germany's Bundeskartellamt to the European Commission); online sellers of posters and frames, and real estate commissions among agents in a local area (with disqualification of company directors in both cases as an added sanction); adult incontinence undergarments; Tasmanian growers of Atlantic salmon; arrangements between competitors concerning recovering the costs of emission compliance in product pricing; and a truck/tractor mechanic in a remote region of Australia who quoted a repair cost for a front-end loader and then sought cover from the only other mechanic in the vicinity. While enforcement is near-universal, the details of national competition laws and nuances in procedure are not. As this guide illustrates, matters such as leniency, exemptions, investigatory procedures, extraterritorial application of competition laws, adjudicative processes and rules, civil and criminal penalties, private actions for damages, and availability of class action or collective redress procedures vary by jurisdiction. And in many instances, the application of principles to a specific issue turns on regulatory practice that may not be fully reflected in written law. This guide is intended as a broad, first-level, survey of principles and practices in a substantial number of jurisdictions. It will, we hope, be useful in helping to identify issues and shape further inquiry. Its scope will also help underscore the fact that effective competition law compliance programmes are an essential element of risk management and client education (as well as having potential salutary effects in affecting the sanctions imposed when companies and individuals find themselves under scrutiny). But the guide is not a compendium of answers to actual problems that arise in the course of business activity. "Answers" require detailed review and evaluation. Competition laws are not only complex as written and interpreted; they most often call for fact-intensive inquiry and analysis by experienced counsel. Those caveats notwithstanding, it is a body of information of immense value to anyone concerned with the application of "cartel" (or "POPPI") questions that arise on a regular basis.